Creating valid, standard compliant BPMN 2.0 process models is not trivial. Even when state-of-art modeling tools are used, model often violate some of the constraints stated in the standard document. 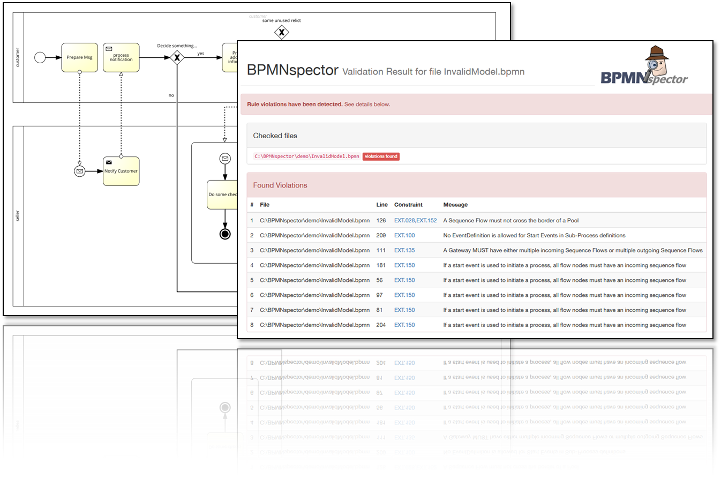 BPMNspector checks single files - or complete directories - of BPMN files and reports violations of BPMN 2.0 constraints. As BPMNspector is developed in Java and can easily be integrated into your project. The sources are available on GitHub - or directly integrate BPMNspector via gradle/maven using the published sources on jcenter. BPMNspector is being developed and maintained as a research prototype by members and students of the Distributed Systems Group (DSG), University of Bamberg, Germany. The tool is licenced under LGPL v.3 licence and freely available at GitHub. For each file a detailed HTML report is generated describing all found issues, highlighting affected BPMN elements. For checked process collections aggregated statistics are available: Showing valid and invalid files, statistics on most frequent errors, etc. For integration into other tools the report can be generated as XML document as well. Simply run java -jar BPMNspector-fat-1.1.0.jar test-file.bpmn -o to perform a sample validation for the file test-file.bpmn using the precompiled runnable jar. The generated HTML report is automatically opened in the browser. Available via jcenter or here. Credits to themefisher.com for this awesome template!